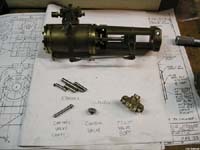 The following are photos depicting the construction of the BigBoy Alco Power Reverse Gear. 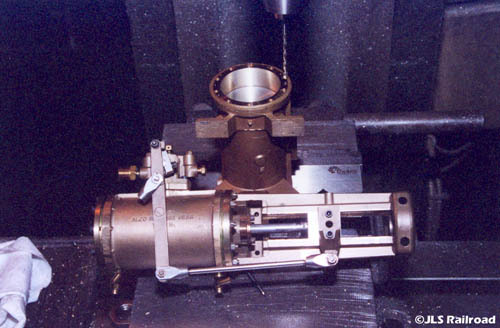 This is a model of the Long Throw variant of Alco's Reversing unit, used primarily on the Union Pacific BigBoy as well as other large articulated locomotives utilizing Walschaert's Valve Gear. 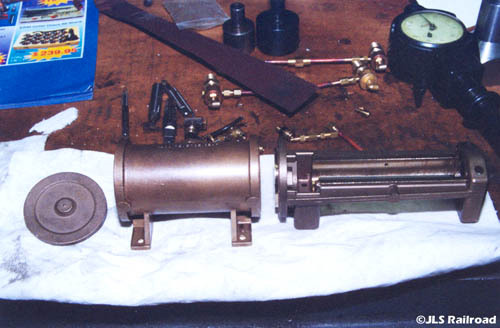 The model is fully functional, utilizing steam to complete the motion. It is modeled in 1.6" scale. Boring the main guideways. 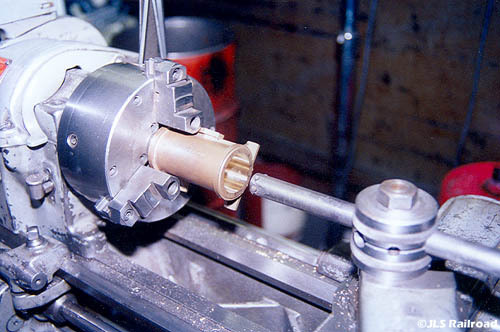 The mount on the lathe needed to be custom fabricated in order to hold the casting solidly enough to achieve a consistent bore. 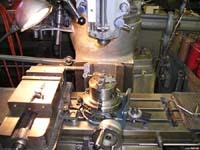 This model is constructed utilizing castings of the cylinder, cylinder head as well as main guideways from David Moore. 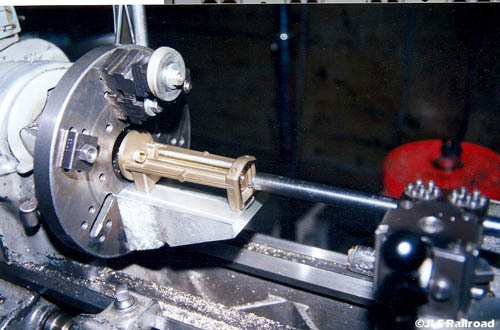 After boring the guideways, they were mounted on an arbor for further machining and holding in the Bridgeport. 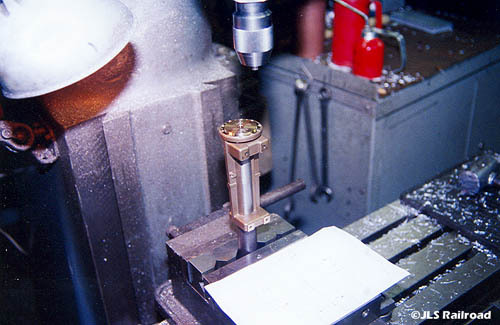 Here, I am drilling mounting holes. 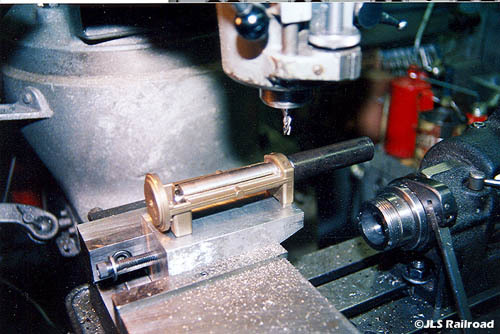 Here we see the completed Reverse Gear in the background, the one I am in the process of machining in the forground in addition to the main valve body, valve body head and packing gland. 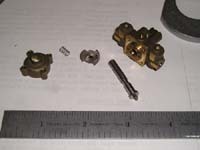 As you will notice, the short throw variant of the Reverse Gear (background) is substantially smaller, intended for small locomotives. 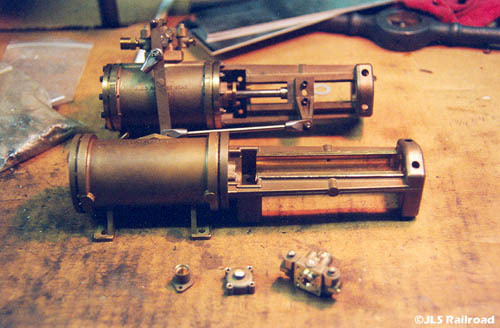 In contrast, the long throw variant (foreground) is intended for use mainly on large locomotive, typically articulateds. Here we see some of the many intricate parts needed to be machined for the project. From left to right, we have the valve body head, piston spring, control valve, control piston, and main valve body with all the porting.